Note: The first phase of this series is complete. Click on the links below for each part. Part 1: Let’s Build a Band App with LoopBack! In this series, we will work through building an application to support the needs of DIY bands. We’ll start out solving some basic problems and move into more complex ground, eventually transforming the application into a platform that others can use and build upon. There is a corresponding workshop as well as a code repository. 🖥 To see the code for this step, here is commit/diff. We are starting from scratch so there is no previously in this episode :) but we do have some prerequisites, the first being Node.js. We can easily install Node for our platform at the following website: nodejs.org. With Node, we get npm, the Node package manager. We will use npm to install our second prerequisite and that is LoopBack. 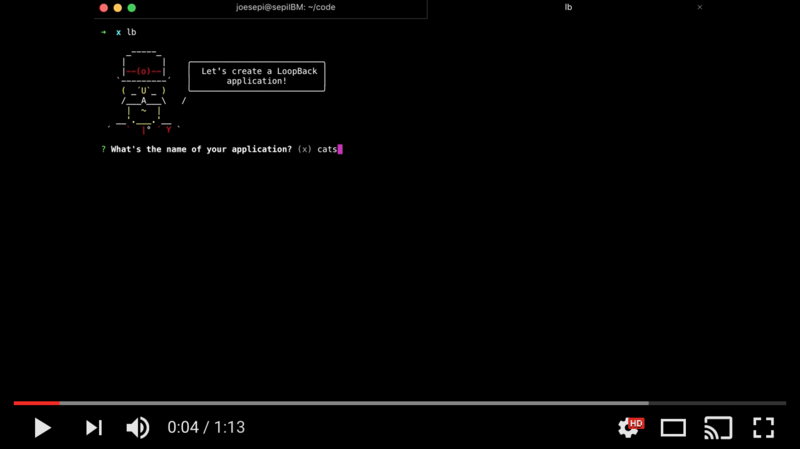 Once we have Node installed, we can run npm install -g loopback-cli. This will install the LoopBack cli globally (-g) on our machine so we can initialize a LoopBack application in any directory on our computer. In this episode, we will install our prerequisites, get an understanding of what LoopBack provides and initialize our LoopBack application. LoopBack is an open-source framework to rapidly build RESTful APIs in Node.js. It has a command line interface (CLI) tool that you can use to scaffold your application and build out your API layer based on your data (a model-driven approach). It isn’t just fast and easy; it’s also robust and extensible. It is built on top of Express, so it has widely-used and battle-tested foundation. We can initialize a LoopBack application in our terminal by typing lb or lb app and this will invoke the generator. The generator will go through a series of prompts to scaffold our LoopBack application. Let’s get started. What’s the name of your application? The first step is to name our application. Let’s call it: band-app. In this step, we are simply choosing the name of the directory that we are going to build out the application into. By default, it assumes we would like to create a new directory with the same name as the application that we have given in the previous step. So let’s hit enter and let the generator do its work. Note: If we want to name our directory something else, we can do so in this step. If we had already created a directory with the same name as our application—we are working from that directory—LoopBack will detect this and we could simply hit enter. We will choose the current version of LoopBack, 3.x. Note: While LoopBack version 2 is still being supported, version 3 is the current version and in general you should use it for new applications. We will choose the default option as it is useful to have a built-in User model to extend from when building our model for our users. Note: As alluded to above, it is best practice to extend base models such as User rather than using them directly. If we have multiple objects extending from a base model and we modify a base model, there may be adverse effects on all the models extending it. Protip: in the command line, type j or k or ↑ and ↓ to navigate up or down. For an explanation of all the files and directories that the tool creates, see Project layout reference in the LoopBack documentation. At this point, the tool has scaffolded our application. Then it runs npm install to install all of the application’s external dependences. This may take a moment, depending on internet connection. Do not be alarmed by the many modules that are installed: to reduce duplication of effort, Node.js has a large ecosystem of many small modules. The Node package manager, npm, handles these modules in a smart and efficient manner. Once the tool finishes installation of external modules, we will see a listing of these modules in a tree structure. At this point, our application is initialized and the terminal outputs some helpful next steps to continue development. We can run our node app with node . and it will output, two URLs: one which will take us to the root of our app and one which takes us to our API explorer. There won’t be much at the explorer yet, but we will ‘explore’ that later (sorry for the pun), but if we go to the root of our application, we will see a timestamp letting us know it is working properly. The code that gets the timestamp and outputs it in the browser in our server/server.js file. Until next time, you can check out that server file and see that it looks very much like an Express server (remember, Express underpins a LoopBack application.) We may also take a look at the config.json file, which contains some of the configuration for our application, such as our API root, the host and port information. Feel free to poke around further. In the next episode, we will initialize our first endpoint which will be generated based on some questions about our data. It’ll be fun, fast and easy! See you then.